hile getting ready to conduct another interview for “The Editors” series, I sent an appropriate enquiry to the largest printed German audio magazine – “Audio” (it is a coincidence, of course, but the latest interview from the series also involved another printed German magazine – “Stereo”, read HERE). “Audio” has been published for many years and it is part of the same publishing group as, for example, “Stereoplay”. It is perhaps the most well-known German audio magazine that is still printed. The only problem is that I am going to leave “Audio” at the end of July. I have been working here as the Editor-in-Chief for twenty years. The thing is that the publisher wants to move the whole magazine to his headquarters in Munich, which is, for many reasons, totally unacceptable – not only for me, but also for the whole “Audio” team. So, the magazine is still going to be published, but beginning from the 10/2015 issue it is going to be prepared by completely different people. 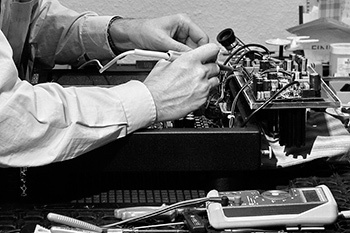 I do not know if you remember, but my friend’s – Dirk Somner’s magazine also has its seat in Munich: hifistatement.de. It is where, by the way, my test of the Accuphase A-70 amplifier has just been published in German, read HERE; while Dirk’s review of The Preamp can be found HERE). Isn’t it a coincidence that the largest high-end exhibition in the world is held in the capital city of Bavaria and that the largest German audio magazines have their seat there? I do not think that there is such a thing as coincidence, as far as I understand probability calculus correctly, but there must be something in the city that attracts people conncected with high-end audio. So, it should not be surprising that the company whose products we are testing this time is also connected with this place. 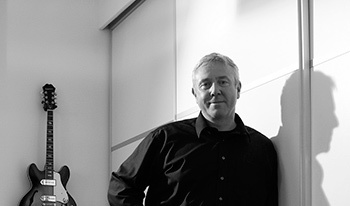 The Einstein brand is Volker Bohlmeier’s lifework. I had the opportunity to meet him over dinner during the exhibition in Munich this year (read HERE). I then learnt that Volker is Dirk’s good old friend. They met at the university and used to play together in one band – Volker played the guitar and Dirk – the bass guitar. It was when I heard Volker’s products for the first time in a controlled environment (i.e. 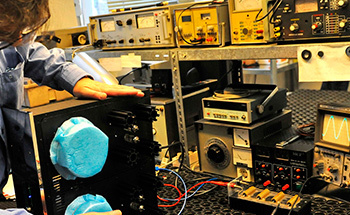 not at an exhibition) – they are the point of reference in the mastering and testing system of the Editor-in-Chief of hifistatement.net, in his studio in Munich. The company, celebrating its 25th anniversary, owes its name to Albert Einstein, the mathematical genius. His father, Hermann Einstein, ran an electrical company at the end of the 19th century in Munich. He chose to work with direct current at that time, just like another genius – Alexander Graham Bell. And although Bell was wrong, because the “right” current was alternating current, it is he who is known as the “father of electricity” – not Nikola Tesla, who understood the new invention better. Anyway, the use of alternating current in households and for the purpose of lighting streets forced Hermann Einstein to close the company down. When it comes to Volker’s company, it was built on the right foundations at the very beginning, so it has been successful. It is a premium, high-standard company. It can be seen right away when we look at any of its products – they are characterized by a tasteful form, excellent craftsmanship and nicely matched packaging. The company started in 1990 with a solid-state amplifier called The Amp and, as Michael Fremer writes, the amplifier was a hit for the next six years when it was in production (read HERE). The next step for the company was to manufacture tube products that strengthened its status. Today, the company is known all over the world, especially in Japan, where its product tests and advertisements are regularly published in the most important Japanese audio magazine “Stereo Sound”. Both of the tested devices entered production in 2012 and they are, as far as high-end standards are concerned, fairly new products. Non-standard solutions have been used in the construction of both and although they can also be found in products of other companies, here they have been upgraded with exceptional care (read below to find out more about the company history). The preamplifier is the successor of The Tube model. Its specific feature is a completely balanced design and the presence of as many as 19 amplifying tubes – double low-power triodes: 10 JAN Philips NOS 6922 tubes on the input and 8 EI NOS PCC 88 on the output. The latter used to be applied in deflection coils of TV sets, but also prove very useful in audio devices. 10 input lamps operate all the time (two per channel). Each input has its own complete path, with tubes and other elements. Normally, there is a selector (switch) on the input, which is used to select the active input. After switching to the source that we want to listen to, signal gets to the appropriate preamplifier where it is buffered, amplified and damped (in different configurations). The Preamp has been built in a different way. All its inputs are active all the time – there is no input switch. By selecting the input that we want to use, we connect heater voltage to the tubes that operate in it. So, it is necessary to wait for a moment before sound can be heard. Volker has decided to choose such an expensive and inconvenient solution because tubes are extremely sensitive to what we connect to their control grids (to the input in this case) and loading the input with a switch is problematic. Of course, one can try to get the best selector in the world, but there is nothing better than a lack of it – so, there is no switch in The Preamp signal path – it is located outside it. The main feature of Volker’s monoblocks is included in their name – it is an OTL (Output Transformer-Less) design. In classic tube amplifiers, between the amplifying element, power tubes and the speaker there must be an impedance-matching transformer which matches high tube impedance to low speaker impedance. It means having a few hundred meters of wire, usually of poor quality, in the signal path. However, transformers also have their advantages – among others, the important function of protecting speakers from damage. So, there are pros and cons of eliminating a transformer from the signal path. However, it is possible if tubes of low output impedance are used in a parallel connection of two or more – the most frequently used ones are the Russian 6C33B tubes, but the EL509 pentodes and other tubes are also used. The most famous companies that have made such tubes their hallmark include Atma-Sphere and GRAAF. As a rule, an OTL amplifier must have a balanced design, which neutralizes tube supply voltages. Earlier designs often had a problem with that – when one of the lamps (in one of the signal halves) changed its characteristics in time in a different way than other tubes, or – God forbid! – was damaged, the whole supply voltage appeared on speaker terminals, which resulted in their instant destruction. So, the success of the Einstein company connected with OTL amplifiers relies to the same extent both on excellent sound and exceptional protection circuits. To tell you the truth, I have not heard of anyone having problems with any Einstein amplifier. I first met Rolf Weiler, who is responsible for all EINSTEIN designs, in the 1980s. It was in Wiesbaden and we were trying to repair a Braun Coffee machine together around midnight at the home of a musician – our friend. I soon found out that Rolf is also a musician (he plays the saxophone) and has a similar idea of how music should be “reproduced” by an amplifier. Since he is a professional high frequency specialist and an extremely experienced designer, he had already come up with a precise plan of how I could make this vision come true. In 1988 we hurried up with our preparations and the EINSTEIN Audio company was registered a year later. It employed three people at that time: Volker Bohlmeier, Rolf Weiler and Gerhard von Berswordt-Wallrabe. In the same year the first prototype of a transistor integrated amplifier – The Amp – was prepared and presented at the Internationale Funkausstellung (IFA) exhibition in Berlin. Its production started in 1990. The amplifier was awarded the Component of the Year award by the Japanese magazine “Stereo Sound” for two consecutive years. It is important to know that it is very rare for a Japanese magazine to award the same product twice in a row. By the way, I also met my wife in Wiesbaden. She was studying Interior Design at the university. She gained her engineering diploma there and has now been responsible for the look of our products for more than twenty years. She is also responsible for feeding me well (laugh). She really is a great cook, too. My job in this field is to find the right wine for the food she serves. My cellar is big enough, so, up to know, I have always been successful. All in all, Wiesbaden has not been a bad place for me. Since then we have produced several EINSTEIN amplifiers, so each of them is closer to our ideal. One of Rolf Weiler’s maxims is that ‘The best amplifier would be an amplifying wire’– and it has been the premise for designing any EINSTEIN product. In general, this means that the signal path has to be as short as possible and that signal should stay as unmodified and pure as possible. I think we have gone very far with both “The Preamp” preamplifier and the “Output TransformerLess” mono power amplifier called ‘The Silver Bullet’. In our opinion, both are milestones in every single respect. 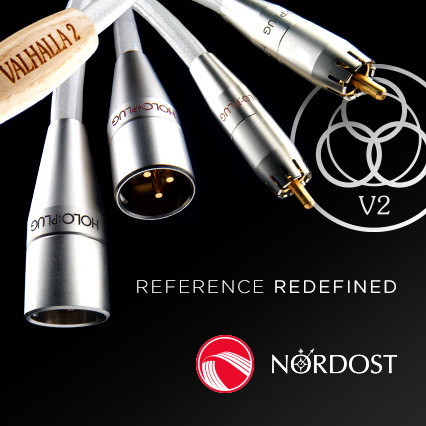 Both designs show very clearly Rolf’s capability to create unorthodox but elegant and perfect technical solutions, such as the switching of the heater voltage of the input tubes for input selection on The Preamp, which is truly unique. The EINSTEIN Silver Bullet OTL is another typical EINSTEIN product, offering a fully symmetrical circuit design, which guarantees the best possible signal-to-noise ratio. Even numbered distortions, which have adverse effects on sound quality, are simply not part of this type of a circuit and therefore the signal remains pure and free from any such distortion interference. 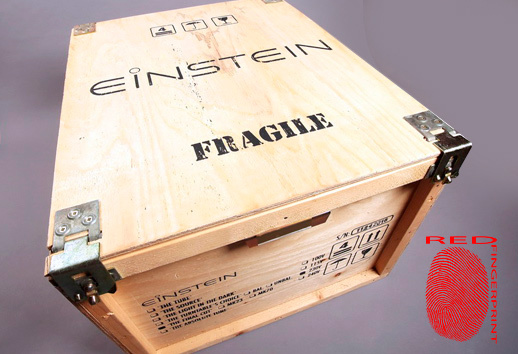 Each EINSTEIN product offers such simply brilliant features which make the EINSTEIN amplifiers sound so incomparably pure and natural – just as if there was no amplifier at all – and they are definitely part of the success of EINSTEIN. During all these years we have improved every single circuit many times – and we continue doing research, and are constantly using new parts, new materials and new technologies, exploring new production possibilities to check if they offer an opportunity to make our products even better and to bring them to new levels of refinement. Knowing where we are today, I wonder if we are going to be able to improve some things any further. But when I look at our very new products, I think there is still left a little bit of room for change and improvement. Taking the last steps requires even more effort, but I really believe it`s worth the work. After all the years in the audio business, I am still very happy with my job and I am very keen on going on. I don`t want to say, “I praise God” – that would be too much, but in some way it was a lucky coincidence for me to end up in this profession. I still really enjoy listening to music when I am not busy trying to improve my guitar performance. As I used to tell my wife, I started dealing with high-end music systems when I realized that I would never be a first-class guitar player. But here, just like in the case of wine, I am quite a good collector. Carmen McRae & Julie London, Carmen McRae & Julie London Bethlehem/Victor Entertainment VICJ-61458, “Bethlehem K2HD Mastering Series | No. 8”, K2HD CD (1954/2007). Dominic Miller & Neil Stancey, New Dawn, Naim naimcd066, CD (2002). Electric Light Orchestra, Discovery, Epic/Sony Music Japan SICP-30112, Blu-spec CD2 (1976/2013). John Coltrane, Soultrane, Prestige/Analogue Productions CPRJ 7142 SA, (1956/2014). 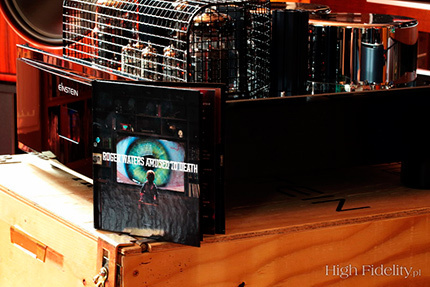 Rogers Waters, Amused To Death, Columbia/Legacy/Analogue Productions 5478842, SACD/CD (1992/2015). The Modern Jazz Quartet, European Concert. Volume One + Two, Atlantic/East West Japan, AMCY-1186-7, "Atlantic Jazz Collection, 50 Years", K2HD, 2 x CD (1960/1998). This Mortal Coil, HD-CD Box SET: It’ll End In Tears, Filigree & Shadow, Blood, Dust & Guitars, 4AD [Japan] TMCBOX1, 4 x HDCD, (2011). Thom Yorke, The Eraser, XL/Warner Music Japan WPCB-100001, CD (2006/2007). Tomasz Stańko Quartet, Lontano, ECM 1980, CD (2006). One of the idioms of the audio world is the conviction that an audio product should reproduce sound faithfully enough to make it impossible to be distinguished from a live event. It is a beautiful and admirable idea which I have written about many times. However, just like any other idea, it is just a thought construct which cannot be fully implemented. It is not even known exactly what it would be like if this was accomplished – would you have a philharmonic hall at home? A concert hall or a stadium? That would mean the first sounds would ruin the whole room, or perhaps the whole building. The volume would be so high that not only our windows, but also all our neighbours’ windows would be blown out. And this is just one of many problems. 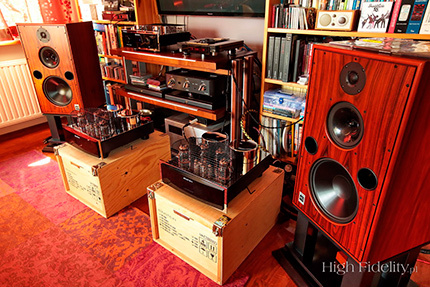 Sound reproduction at home is therefore a separate field of knowledge and art. As such, it has both a “core” that everyone agrees on, i.e. there is a general consensus regarding a set of features that everyone accepts as the right ones, and a margin which is also characterized by common agreement, but with modifications that depend on each individual. That is why in perfectionist audio and its assessment there is a tendency to be as objective as possible, and at the same time keep “my own” subjective opinion at a healthy level. [… ] It is NOT THE PURPOSE OF A PREAMPLIFIER to inject different colorations into sound to mask out the imperfections of the previously located components. By enabling users to do pick the tubes for different sources and putting those objectives into the initial design is an indication that either the designers were Morons who had no idea what they were doing or the unit was meant to be used by Morons. Romy the Cat, The objectives of Einstein self-entertaining Preamp, w: www.goodsoundclub.com, [online] www.goodsoundclub.com/GetPost.aspx?PostID=3555, 05.08.2015. Since there is no such thing as “ideal live-like sound”, we can move within some space in which two different kinds of sound can be equally good and can equally well express the intentions of the artist and the team responsible for recording and publishing the material, to the extent that the music reproduced arouses our emotions. These could be any emotions – even boredom and impatience, as live music performances often cause them. It is important that the sound should be of high enough quality to make us sit in front of speakers or with headphones on, waiting for what is going to happen in a moment, completely involved in the experience. And, to tell you the truth, I hadn’t expected that of Volker’s amplifiers. Of course, I had been aware that it was a top-class product – it was enough for me to see products with the Einstein company logo in Dirk Somner’s system. However, I feel reluctant to use the 6C33B tubes. 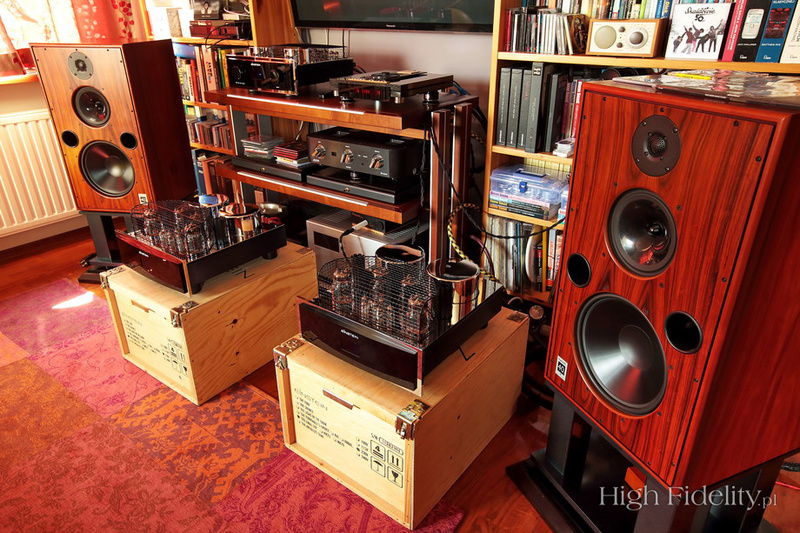 It is the same feeling as in the case of the KT120 beam tetrodes – they have been accompanied by interesting amplifiers, sometimes very good ones, but it has never been “my” sound, until I heard the I-35 integrated amplifier produced by the Jadis company from France (more HERE). The way in which the company implemented the tetrodes made the sound outstanding (bearing in mind the price of the device). So, what I have been waiting for all these years is, perhaps, The Silver Bullet OTL amplifier – I have been waiting to hear what this tube can really do or to check what can be done with it when one knows what kind of a device it is. The German amplifier, both with my Ayon Audio Spheris III preamplifier and with The Preamp, produced low dense sound, which is what I like. The density did not result from additional bandwith load or from colorations, but from an incredible number of harmonics sounding in unison with the basic sounds. This gave an impression of a multitude of “sounds”. I know people who are repelled by this, because they feel “harassed” by such a great amount of information. However, I think that after accommodation they would find out that it is also “their” sound and that afterwards everything else would sound empty and dead. As I am saying, I have listened to the amplifier both with the reference preamplifier and with its natural partner – The Preamp. I suppose that everything sounds better with the latter. Both systems are representative of a similar class, but the features in question were more prominent and impressive in the Einstein set-up. This is music which comes TO US, as opposed to music from the Naim Statement system that I once heard (read HERE and HERE). In the case of that system, it was WE who entered the musical message. Although, in my opinion, the systems belong more or less to the same class, our perception of them is completely different. Einstein fills the space in a room as if it was transforming the existing air particles into other ones created by the recording. It is easiest to hear in the case of tracks in which space plays an important role, e.g. Roger Waters’s Amused To Death. The album, which has just been re-issued by Analogue Productions, has been coded in the QSound system, thanks to which sound literally surrounds us. With the Einstein amplifier it was a thick, smooth and tight cocoon.